Sometimes things don’t work out as planned. Take these beautiful swirl cookies, for example, which I intended on bringing to a holiday cookie party last week. Due to my hectic schedule, I broke up the steps over the course of a couple of days. Monday: make dough. Tuesday: make filling and complete cookies. Wednesday: attend party. A good plan in theory, but sometimes even good plans don’t even go as planned. Plan fail #2: I ended up working a 15-hour day on Wednesday, which meant I had to skip the party. Talk about a total drag. Luckily one of my friends was able to deliver my cookies on my behalf, but I was still totally bummed to not have the opportunity to taste everyone else’s creations. But I did sneak a few of these for myself, though. Happy happy! Put figs, dates, water and 2 tablespoons of sugar in a food processor and blitz until smooth. Transfer puree to a small bowl and set aside. Whisk together flour, cinnamon, baking powder, baking soda and salt in a medium bowl. Beat together butter, cream cheese, and remaining 1/2 cup granulated sugar in a large bowl with an electric mixer at moderate speed until pale and fluffy, about 3 minutes. Beat in vanilla and yolk until combined well. Add flour mixture and mix at low speed until just combined. Halve dough and form each half into a rectangle. Chill, wrapped in plastic wrap, until firm, about 1 hour. Cut each triangle of dough into 16 squares. Using your hands, roll each square into a ball then use your thumb to create an indent about half way into the center of each cookie. 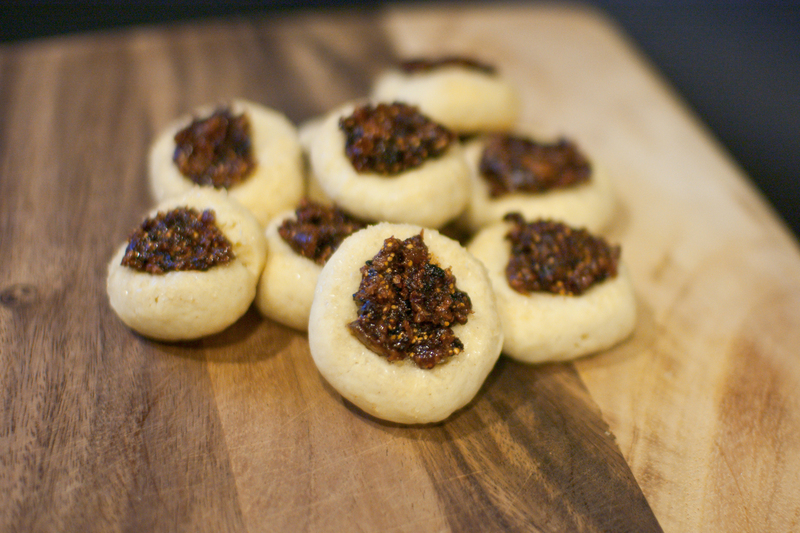 Sprinkle cookies with raw sugar, then fill each indent with a small scoop of fig and date filling. Bake cookies for 20 minutes or until cookies are slightly browned at the edges. Transfer to a cooling rack and let cool completely before serving. Hope you work week gets better! Sometimes things happen for a reason (though working late probably shouldn’t be a reason). Things didn’t go the way you planned but these cookies sure did end up looking beautiful! And I’m sure they tasted even better. Hope you have a lovely holiday, Bobbi! I hope you get some time off this weekend and enjoy the holiday!